Joy Creek Photo Archive (c) all rights reserved Also known as Rosa 'Brownell's Nearly Wild', this charming rose has fragrant, three-inch wide, single flowers that have white centers and prominent bosses of yellow stamens. 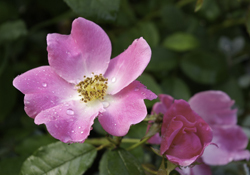 The pink of the flowers pales attractively as the flowers age. This is an excellent garden shrub, producing numerous flowers over a long period of time. At Joy Creek Nursery, 'Nearly Wild' forms a mid-sized shrub with excellent, sturdy, disease-free foliage. Summer. 30 in. x 30 in.